WGNS' Bryan Barrett with the call. 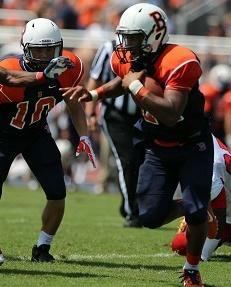 Blackman scored on their first four offensive series. They'd get the ball inside the five twice more in the first half, but fumbles each time ended drives. Jennings had 125 yards on 25 carries and scored again in the third quarter on a 37-yard run to go up 49-7. Running back Charlie Davidson piled up 138 yards on 12 carries and two touchdowns. The Blaze amassed over 580 yards in total offense in the rout of Mt. Juliet. Blackman jumps back into district play next week at Stewarts Creek.